Your gravatar: it’s not just for web pages any more! 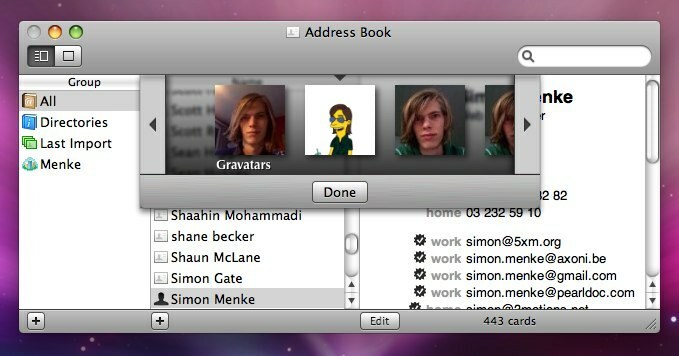 Simon Menke wrote a Mac OSX 10.5 plugin for the address book which brings gravatars off the web site and into your contacts. Simon intuitively grasped something that we were planning on highlighting after doing some more work with the gravatar site and processes: gravatars are something that can be used almost anywhere. Sure the most common place you’ll see them now is on blog comments, but the sky truly is the limit. Way to go Simon! i like this a lot and can’t wait to upgrade to 10.5 to give it a spin. a request for you fine gravatars folks: merge/work with openid. i would love to see services like yours, openid, and the forthcoming open source social timeline working hand in hand to create a far more integrated internet, one that doesn’t require us all to sign up a billion times and enter/maintain our data across hundreds of websites. I think the G in Gravatar stands for Global. So the more places my Gravatar will show up, the better. Ah but what about the people on Windowss!! Very nifty, and a great start. In addition to email, I hope see it implemented in chat clients (Yes, GoogleTalk, I’m speaking to you. ), forums and other social gathering places, among other things. Hope there will be more addressbook software use it. That’s pretty cool. I’m a PC guy myself, but I’m pretty sure that if he did it for Mac someone will do it for PC. So .. if the ‘G’ stands for ‘Global’ what does the ‘r’ stand for? Thats cool. I don’t use a mac – but nice hack. A firm step in the right direction. I don’t own a Mac (yet), but a stronger sense of personalization and identity, especially for a versatile application like OSX’s Address Book, is definitely the way to go. Wrote a rhetoric-driven blog entry supporting the exposure and spreading of Gravatars because I like the idea so much. A few of my visitors have already taken up the proposition. This is a great development. I’d love to be able to import Gravatars into GMail address books as well, or at least Thunderbird. Okay — I must be missing something since I tried to install this twice, logged out and back in as required, and it just wont show up for me. ??? Love this idea! I absolutely love this concept! Its one of he important steps in Branding your website, blog , business or even yourself online. I have defined the same Gravatar for all my emails, to keep the branding going! Too bad I am a Windows user (XP) – but I believe within some time, it would be available for Vista as well. Best of luck guys ! Does that mean we’ll be able to use them on instant messaging applications as well? Really like the idea, ill finally be creating my first! Nice. Thunderbird has had this for years. Now this is an awesome idea! Is it just for Mac?¿?¿? I am having trouble viewing my avatar on any site. What did I do wrong? I’m noticing some buggy behaviour in Address Book now since installing this: DB literally disappears from my desktop, even though it’s still open. When it finally reappears (usually when hitting ESC for some reason) I can no longer quit it normally, I have to force quit. I have no way of contacting the developer, and don’t know how to uninstall. His blog has closed comments. You want me to refer people to sign up with your service just to get an avatar on my website? Are you crazy? You know how many private companies could make use of your service?? You know how many want to incur the support of being bothered with your authentication service? I could implement gravatar support now, but could I tell management to suggest gravatar on account creation: no — not in good faith. Apokalyptik – the plugin’s gone offline, and the author’s blog is now missing. Does anyone have new info on it? I’ve just written Simon a message to ask for a copy and will post any updates I find here. Evan – how much are you paying for this service? The link doesn’t work anymore, I redid a simple version myself, visit my blog, http://momo.brauchtman.net/2009/03/missing-link-update-contact-image-in-macs-address-book-using-gravatar/, to get it.